Preschoolers are beginning to use descriptive words, and five-year-olds can use many adjectives and adverbs spontaneously. Letter knowledge can be developed by involving your child in a variety of reading or writing activities. Parents and caregivers play a special role in developing the skills below, which preschoolers need in order to become successful readers. 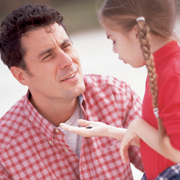 Preschoolers are generally able to speak clearly using adult speech sounds and have mastered basic grammar. Preschoolers are beginning to use descriptive words, and five-year-olds can use many adjectives and adverbs spontaneously. They can also express their thoughts and feelings with language, often through dramatic or creative play. Preschoolers are practicing and enhancing their narrative skills when they tell personal and creative stories. Preschoolers are also discovering that others have their own thoughts and feelings and can adopt other roles (mother, policeman, etc.) in play. Parents will find that they can now discuss other people's feelings with their preschooler and she will understand and empathize with different people and situations. 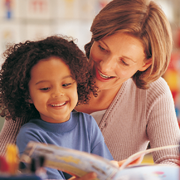 A child's success at reading is closely related to his or her ability to hear sounds. Phonemic awareness is the ability to hear and recognize different sound units in words and to understand that words are made from smaller sound units. Understanding that words are made up of smaller sounds helps children break the code between written language (words) and spoken language (sounds). Research indicates that this is the best predictor of the ease of early reading success - better even than IQ, vocabulary or listening comprehension. Read about games that develop phonemic awareness later in the section. Engage your child in activities, such as rhyming and alliteration games, that direct her attention to the sounds in words. Rhyming can begin with Mother Goose rhymes and continue with rhyming picture books, silly rhyming games - such as the Name Game - and songs with rhyme. Letter knowledge includes understanding that letters are different from each other and that each letter has a name and its own sound. Letter knowledge can be developed by involving your child in a variety of reading or writing activities like pointing out and naming letters in alphabet books or on signs and labels. Play games using the alphabet; ask your child to find letters in books, magazines, newspapers and other print. Teach your child the traditional alphabet song and learn new ones such as, "Chicka Chicka Boom Boom." You also can help your child write his or her name and other familiar words with magnetic letters, marker and paper or on the computer. Help your child learn to recognize her name in print. Encourage her to spell and write her name and display her name in special places in your home. This includes understanding that writing in English follows basic rules such as writing from top to bottom and left to right. Preschoolers will often pretend to read a familiar book with pride. Encourage your preschooler's newly discovered abilities and emphasize all the different things he already knows about books and reading, including holding a book correctly, turning the pages correctly, understanding that the book has a title, a beginning and an ending. Your child may also be able to point to words on the page of a picture book while you read. Point out print everywhere in your child's environment. By age five, a child should understand that print is all around him and that it has many different purposes including directions, lists, menus as well as stories. 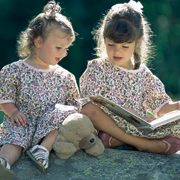 Children find meaning in text when they can make connections between the story and their own experiences, other books or the world around them. When reading with your preschooler, ask her to make predictions based on the cover and title of the book. Revise these predictions as you gather more information while reading. Use clues from the illustrations to make sense of the story. Ask questions about the illustrations and the story such as, "What are the ducks doing?" or "Remember when we saw ducks at the park?" When you come across a new word in a book, ask what the word could mean, offering assistance and explanation before your child becomes frustrated or loses interest.